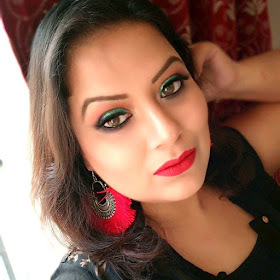 As Maybelline recently launched 10 beautiful "POWDER MATTES" new formula lipsticks which are named as "Maybelline New York Color Sensational Powder Matte Lipstick". Being a matte lipstick lover how can I overlook this range? So without giving second thoughts, I grab four pretty lipsticks from this range. It comes in a silver case packaging with matching semi-transparent cap that matches the color of the lipsticks. It has a mild fragrance in lipsticks which disappear after few minutes of applications (thankfully). I grabbed four lipsticks from this range. They are GET RED-DY, UP TO DATE, FUCHSIA FLASH, MAKE ME BLUSH. GET RED-DY- A beautiful red with orange undertone in it. Perfect for fair to medium skin beauties. UP TO DATE- A beautiful magenta pink shade that is perfect for all skin tone beauties. FUCHSIA FLASH- a bright pink which is perfect mainly for fair skin beauties. MAKE ME BLUSH- a neutral brown shade with strong peachy undertone shade that will look good on cool undertone fair to medium skin beauties. Among all the four I picked up my personal favorite is "UP TO DATE" a flattering shade that enhances my skin tone. Coming to the quality of the lipsticks.Lipsticks are my first love always and I am the hoarder of matte lipsticks mostly. So when Maybelline launched this POWDER MATTE range I simply can't ignore the range and grab four. The texture of the lipsticks is silkier matte or you can say just matte. The lipstick is super pigmented. Only two swipes are enough to get the actual shades. The lipstick glides super smoothly on lips without tugging or pulling of lips. And on my lips, it stays more than 4-5 hours with light snacks. The lipstick is comfort matte on lips that don't dry up your lips to look flaky with time. It doesn't even bleed from the corner of lips. Yeah, it might fade a bit after an oily meal but at this price range, the quality of the lipstick really surprise me. I am totally in love with Maybelline Powder Matte lipsticks. The only drawback that I found regarding this range is most of the shades repetitive/dupeable one.